In honor of Shout Factory/GKid releasing Studio Ghibli films on Blu-Ray, Adam is writing an ongoing series highlighting some of the best Studio Ghibli films. The series continues with Hayao Miyazaki’s Spirited Away. 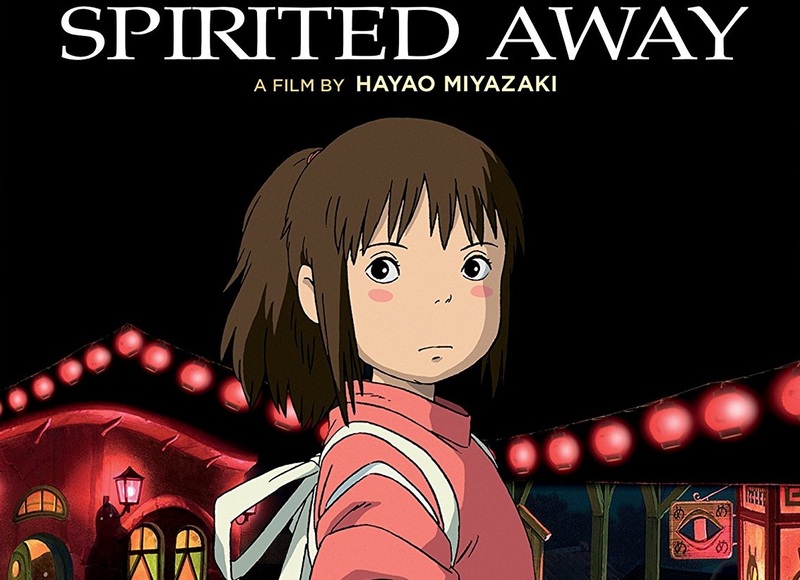 Spirited Away has its director Hayao Miyazaki in a playful grandfather storyteller-mode. A film that feels more of a folk tale told grandparent to grandchild. Chichiro, Spirited Away plucky protagonist, is Miyazaki pointing the mirror at a generation he is trying to understand. In Chichiro he finds a girl that at first glance is a lazy uninterested youth. Slowly through the course of the film it’s revealed that Chichiro isn’t lazy just untested. Oh, does Miyazaki-San test Chichiro during the course of the film. The film begins as Chichiro, depressed and angry, moving away from her friends and school to a new town. Much of the details of the how’s and why’s are left up to you as the film is subjectively told through Chichiro’s eyes. Miyazaki does not care about the details of why but that Chichiro is adverse to this change as many children are. Though these are interesting critiques, at no time does Miyazaki level blame on our hero. If any blame is assessed it is aimed at her parents. Miyazaki shows Chichiro’s parents as disaffected beings who have little care about their daughter, let alone one another. The critiques that Miyazaki makes about current parent are devastating. Chichiro begs and pleads with her parents to leave the abandoned amusement park they find themselves in. Her parents care nothing of her opinion or even value her. They simply continue on their way until they find plates and plates of food. The parents take food, ingesting it like pigs, never stopping to think their actions will have consequence. Miyazaki references Walt Disney’s Pinocchio in these moments turning the parents from figurative to literal pigs. Spirited Away is, at its core, the film is the story of a girl finding her way and her inner strength. Chichiro through this magical realm is able to triumph over test after test, challenge after challenge. She is a normal girl, imbued with only her wits and nothing more. But Chichiro is able to best the most powerful of witches. She is able to help ailing spirits. This isn’t magic but her own determination of will, her inner strength. By not making Chichiro born with some sort of special prowess or birthright, Miyazaki tells a story of an every girl. Someone relatable, that doesn’t have to have magical powers to save the day. Miyazaki creates a film that revolves around this normal girl in extraordinary situation. Spirited Away’s magic and power does not resonate from its creatures, magic or the grand world created. It’s magic and power is drawn from Chichiro, a normal girl, and the film’s message; every young woman is as powerful as any magic or creature in the world. GKids/Shout Factory has received a brand new remaster from Studio Ghibli for their Blu-Ray release of Spirited Away. The original transfers for Bu-Ray and DVD were decent, fairly early in Blu-Ray’s life. This newer transfer looks stunning. The animation lines, colors everything looks cleaner without a hint of artifacting which can definitely be a problem with animation. Bravo to GKids for the care and time that went into this transfer. One would have liked more features than the two that are presented. As this is the film that won Miyazaki his Academy Award more time would be spent on this fact. Fledgingly animators take note that the entirety of the film has been presented in Story Board format. Further making this special, these are Miyazaki’s own hand drawn storyboards. It’s a fascinating watch toggling back and forth between the completed film and story boards. These storyboards give insight into how detailed Miyazaki gets with the design of his creatures and the intricate set pieces (there quite a few in this film). One can imagine that Guillermo del Toro has studied each of these perfect boards as they were the missing dead sea scrolls. I mention the 12 page booklet as it’s a beautiful introduction by Miyazaki himself as there is little in the way of documentary featurettes on this film to give insight to the making of this beautiful film. Beautiful design work and soft critique of current era of children makes Spirited Away required viewing for any astute and adventurous film geek (of any age). Highest possible recommendations. Read our coverage of My Neighbor Totoro here! Read our Coverage of Kiki’s Delivery Service here! Read our Coverage of Princess Mononoke here! Spirited Away is available on Blu-Ray!